"Since I last saw them I've not got married, or had any children, or got a promotion, or inherited a fortune; I've been doing exactly the same things I was doing last time I went." "Well tell them you've expanded." "They'll see that for themselves." Another school reunion looms for Harvey Briscow, and once again he agonises over whether to attend; as the owner of a comic shop, a devout drinker, smoker and full-time misanthropist, he's spent much of his time wondering what might have been had he chosen another path. Nothing in Harvey's life has changed since the last reunion, five years ago, or indeed the one before, and short of fabricating a fantastic change of fortune there's little to be had by going. Not until Josh, his sole employee and only true friend, suggests he may have opportunity to reclaim a very rare comic Harvey once swapped, does he galvanise himself into action. The Swap cracks along at a tremendous pace. 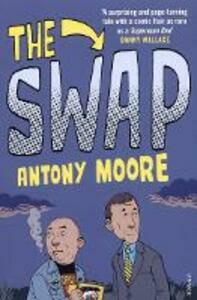 On one level Antony Moore's debut is a superbly plotted thriller, on another, a hilarious black comedy that will amuse anyone who has attended, or considered attending, a school reunion.